Janie Corbin & Old Jack 2002 Ornament (Kunstler) SOLD OUT! KUNSTLER 2005 COLLECTABLE ORNAMENT – "JANIE CORBIN & OLD JACK"
Here for your consideration is the Timber Ridge School 2005 Collectable Christmas Ornament featuring Mort Kunstler's 2005 Christmas scene "JANIE CORBIN & OLD JACK." This is the 10th in a series of ornaments produced and issued by the Timber Ridge School. > In "JANIE CORBIN & OLD JACK" Mr. Kunstler captures a side of the mighty "Stonewall" Jackson known only to a few. In 1862-63, Jackson made his headquarters at Moss Neck Plantation on Virginia’s Rappahannock River. The plantation was owned by Richard and Roberta Corbin, who had a young daughter named Janie, known for her friendly, delightful personality. For a fleeting time, Jackson’s inner heart was revealed to all who were in his presence because of his friendship with his young 5-year-old friend. This Christmas ornament was produced and issued exclusively by the Timber Ridge School, a licensed residential treatment center and accredited educational program serving young men between the ages of 11 and 19 with a history of serious emotional, learning, and behavioral difficulties. Funds for the improvement of campus programs and facilities are raised through the original sale of ornaments. Mort Kunstler, a very generous supporter of the school, donated the use of his work "JANIE CORBIN & OLD JACK" for this ornament. 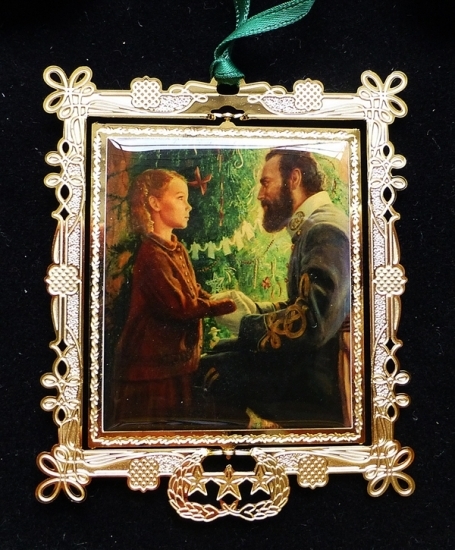 No more than 7,500 of this 10th in a series of ornaments were produced. It has a 24 karat gold plated over brass border and is finished with red ribbon. It is packaged in a green presentation box with black felt backing and comes with a numbered certificate of authenticity and an ornament stand so it can be either hung on a tree or displayed on a shelf.